The Land of Enchantment is aptly nicknamed. There is much wonder to behold, and fun to be had in this state. Choice Home Warranty is proud to help New Mexico’s homeowners relax even more by providing reliable home warranty protection. This border state is well known for its amazing land formations and unique geography. This state’s homeowners know that extremes in weather, climate, and even normal wear and tear can affect their home systems and appliances. Our licensed technicians stand ready to assist you at the first hint of trouble, so you can concentrate on enjoying all that New Mexico has to offer. Choice home warranty offers worry-free coverage and peace of mind to the residents of your state. New Mexico has an interesting history. Before becoming part of the U.S., it belonged to Mexico, which acquired it from Spain. Due to a border dispute between Texas and Mexico, the Mexican –American War broke out in 1846, after which, the U.S. acquired most of New Mexico through the Treaty of Guadalupe Hidalgo. But it wasn’t until 1912 that New Mexico was admitted as our 47th state. After a man found strange debris in his pasture near Roswell, the UFO craze officially began. The air force apparently blamed the debris on a crashed weather balloon, but that didn’t stop people from speculating that it was, in fact, the remains of a crashed UFO instead. Today, Roswell hosts the International UFO Museum and Research Center. New Mexico is our fifth largest state, spanning approximately 121,590 square miles. However, with only 17 people, on average, per square mile, it is the sixth most sparsely populated state. In fact, there are less than 10 people per square mile over two-thirds of New Mexico. It is estimated that this state’s population exceeds 2.09 million residents in 2019. Albuquerque is the largest city in New Mexico with 562,935 people, claiming 1 in 4 of all New Mexico residents. The Great Plains Region, with its high plateau and deep canyons, reaches one-third of the way across the eastern part of the state. It is used for cattle and sheep ranching. The Rocky Mountain Region, where you’ll find Wheeler Peak, runs through the north central part of the state. The Basin and Range Region, in the central southwest, has the Rio Grande running through the center of it. Here you will find flat deserts and mountainous ridges. About 25 percent of New Mexico is forested. It boasts 7 National Forests, including Gila National Forest, the nation’s largest at 3.3 million acres. Interestingly, 75 percent of the roads in New Mexico are unpaved. In the Great Plains Region, you will find the Carlsbad Caverns, with over 119 caves to investigate. Over 10 football fields in length, the biggest chamber in the caverns is approximately 22 stories high. The White Sands National Monument, containing the largest field of white gypsum dunes in the world – 275 square miles of them – is located in the Basin and Range Region of New Mexico. Not only is this desert something to behold, you can go dune sledding on the glistening gypsum. And, Capulin Volcano National Monument is not to be missed. 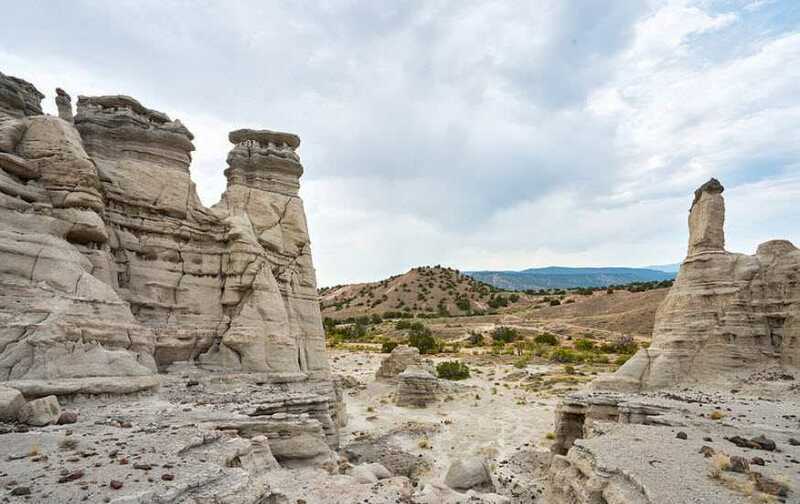 This extinct volcano, located in the Great Plains in the northeast corner of the state reaches over 8,000 feet above the land to reveal views of 5 states – Texas, Oklahoma, Kansas, Colorado and New Mexico. In fact, New Mexico is one of the four corner states: where Colorado, Utah and Arizona meet at their corners. You can stand in these 4 states at the same time. Despite the many wonders this state holds, it suffers from a scarcity of water. Rivers and lakes comprise only .002 percent of New Mexico’s total surface area. Most of the state’s lakes consist of man-made reservoirs. In fact, New Mexico gets only an average of 15 inches of rain across the state, while the national average is 39 inches. Even with little rainfall, thunderstorms are common in the summer. In fact, according to NOAA data, thunderstorms and lightening are the most common natural hazard in New Mexico, occurring, on average, every 4.3 days from March to October. Flood is the second most common natural hazard in this state, according to NOAA, and occurs, on average, once every 13.1 days. After the rain, comes the wind, with an average, 10 tornadoes hitting New Mexico annually. Severe hail, as big as a penny or larger, occurs approximately 165 times per year. Snowfall also varies quite a bit. The average for the state is 24 inches, while Albuquerque gets about 10 inches, Santa Fe sees about 32 inches and the ski areas can get up to 300 inches. The average July high in New Mexico is around 89°F and the January low is about 21°F. The highest temperature ever recorded was 122°F at Lakewood in 1994, and the lowest was -50°F at Gavilan in 1951. No matter where you live in New Mexico, desert to plains to mountains, a New Mexico home warranty can help to protect your home from damages to its critical systems and appliances when the unexpected occurs. Home Warranty coverage and homeowner’s insurance are not the same. A home warranty will provide you with protections beyond and in addition to that which you can get from your homeowner’s policy. In fact, a New Mexico home warranty from Choice Home Warranty will even cover you for damages to your appliances and systems due to normal wear and tear. In New Mexico, approximately 68 percent of residents own their homes. The median home value in this state is $192,000. That’s an increase of 8.4 percent since November of 2017; and, these values are expected to rise another 3.3 percent through November of 2019. A home warranty can protect your New Mexico home and its critical systems and appliances when unexpected problems and breakdowns happen. Are you selling your New Mexico home? Putting your home up for sale can be quite stressful. But, did you know that home warranty companies will cover your home’s systems and appliances while it’s on the market? Knowing that you won’t have to deal with the high cost of repairing or even replacing one of your home’s systems or appliances if something unexpected comes up during this time will certainly give you peace of mind. And, since 80 percent of homebuyers prefer a home that has a home warranty already in place, you may be increasing your home’s marketability too. Do you wish to buy a home in New Mexico? Making such a big investment can get you thinking about what might happen to you if something unexpected occurred right off the bat and you got stuck with a big bill for the repair or replacement of a critical system or appliance in the home. Wouldn’t you rather just buy a home that is protected by a home warranty and avoid the stress? Then, you’ll be assured that you are covered should some unexpected trouble come up. In this state, two-thirds of all households use natural gas as their primary source for home heating. Another 1 in 6 residents use electricity to heat their homes; but, less than 0.1 percent use petroleum products for home heating. Notwithstanding the hot summers and cold winters, New Mexico’s per capita residential energy use is among the lowest in the U.S. And, New Mexico is the seventh largest net energy supplier to the country as a result of its natural gas, natural gas liquids, petroleum and coal production. The median age of owner-occupied homes in New Mexico is 29 to 34 years. The national median age of such housing is 37 years. While this state’s homes are somewhat younger than the national median, it is still quite easy to see how homes of this age could require repairs to or even replacements of their critical systems and appliances, maybe even more than once, in all those years. This is especially true when you consider that the average lifespan of a household appliance is 9 to 15 years. In New Mexico, where heat, extreme cold, wind, hail, and thunderstorms and lightening are all hazards, doesn’t it make sense to want to protect your New Mexico home and appliances. Albuquerque may only get 10 inches of snow in the winter, but that’s plenty. And temperatures in the low 20s can certainly be uncomfortable. You’ll want to keep your heating system in good working order. With a Basic Plan from Choice Home Warranty, you can accomplish this with ease. This plan will cover your heating system and ductwork for any needed repairs, or even a replacement, if necessary. All you need to do is call at the first sign of trouble. Doing this could help avoid a total breakdown and the loss of warmth and comfort that would accompany it. Hot water is a year-round essential. It’s a good thing the Basic Plan covers your hot water heater as well. A new one could cost you well over $1,000. But with Choice Home Warranty, you’re covered for repairs or even a replacement of your water heater too. You’ll have peace of mind with a New Mexico home warranty, knowing that critical systems such as heat and hot water are covered. New Mexico summers can get pretty hot. A well-maintained air conditioner is a must. On average, your air conditioning system should last you about 15 years. There are signs you can look for to tip you off that repairs are needed to keep your system running efficiently. If you start getting abnormally high utility bills, for instance, this can mean that the condensing coil in the outside unit needs to be professionally cleaned. Another sure sign is strange noises coming from the inside unit. This could mean anything from a slipped belt, to a faulty blower motor. If the air is warm, or just not cooling like it should, you may need a re-charge of Freon. And, if you notice a pungent odor coming from the unit, your wire insulation may have burnt out and need immediate attention. Upgrade to a Total Plan with Choice Home Warranty and help is just a phone call away. It’s easy to see how important it is to keep your New Mexico home systems and appliances in good repair. With Choice Home Warranty, you have only to make a service call when you first notice a problem. This will help protect you from the total breakdown of your systems and appliances and from the hassle of being without them. Why is a Home Warranty Necessary in New Mexico? Heat, extreme cold, wind, hail and thunderstorm and lightening are all hazardous to your home’s critical systems and appliances. A New Mexico home warranty can help to protect you when covered items break down, even if the problem is from normal wear and tear. After a weekend of fiestas, capped off with duck races and dune sledding, you probably just want to relax, throw in a load of clothes, and kick your feet up while the clothes washer does the work for you. This could all be ruined if your washer goes on the fritz. But, a Total Plan from Choice Home Warranty covers both your clothes washer and clothes dryer, so you can set them and forget them. But what if you’re cooking up a fiesta of your own and your stovetop won’t heat up? Don’t panic. The Basic Plan covers your oven, range, cooktop, built-in microwave, dishwasher, and disposal. Upgrade to a total plan and your refrigerator is also covered. The best part of all is that with the Total Plan, you get all the benefits of the Basic Plan as well. What Does a New Mexico Warranty Cover? How does a New Mexico Home Warranty Work? Just as soon as you notice a problem with one of your covered systems or appliances, give customer service a call. They will put you in touch with a service professional who can handle the necessary repairs. All of Choice Home Warranty’s service providers are highly rated, full insured, licensed, and carefully vetted before ever being sent to your home. Our goal is your complete satisfaction with your repair experience. A small service fee will be collected at the first visit. Then, any further work on your covered item will be taken care of by your home warranty plan. If your service technician determines that your covered item cannot be repaired, it will be replaced per your warranty. This is quite valuable in New Mexico where homes are old enough that appliances and systems are beginning to wear out. With a New Mexico home warranty, you never have to worry about having your savings or emergency accounts wiped out by a single repair or replacement. All you will need to do is make sure you keep a modest repair fund on hand for service fees as needed. You truly get peace of mind with a home warranty from Choice Home Warranty. With two plans to choose from, as well as a variety of add-on protections, Choice Home Warranty allows you to tailor a plan that fits your individual needs and lifestyle. If you’re looking for a comprehensive home warranty plan in New Mexico, Choice Home Warranty is an excellent selection.